When homeowners look to improve their home value, roofing isn’t always the first thing that comes to mind. The thing to remember is that not all home improvements are created equal. For example, the 2018 Cost vs. Value report found that homeowners in Seattle will recoup 88% of the cost of a new roof, while a major kitchen remodel will recoup 82%, and an upscale bathroom remodel will recoup 80%. Here are four reasons why metal roofs, in particular, will improve your home’s value. The most common roofing material you’ll see around any neighborhood, whether you’re in Seattle or Olympia or Snohomish, is asphalt shingles. While popular and affordable, they typically only have a lifespan of 25 years. In contrast, metal roofs have a lifespan double that of asphalt shingles—up to 50 years. When you think about it, there’s a possibility of replacing an asphalt shingle roof at least two times before one metal roof is replaced. At State Roofing, we offer a standing seam metal roof that features seams elevated from the roof. This design protects the weakest point of any material, which is the seam. In addition, metal roofs can withstand some of the harshest weather Mother Nature has to offer. This makes metal roofs ideal for the ever-changing weather we tend to see in the Pacific Northwest as we experience a wide variety of weather, including week-long showers or wind storms. Withstands winds up to 120 MPH. Includes 24- and 26-gauge G-90 galvanized steel construction, making it 50% stronger than the industry standard. Features Kynar 500 and SMP finishes to create a “no fade” surface that won’t crack, split, break, or burn. Includes 30-gauge G-90 galvanized steel construction, making it 50% stronger than the industry standard. Includes 26-gauge G-90 galvanized steel construction, making it 50% stronger than the industry standard. The longevity of a metal roof will help increase the value of your home due to its incredible durability. It can withstand high winds, is made of steel, and won’t crack or split from the Pacific Northwest’s randomized weather patterns. There’s also no denying that the Pacific Northwest sees its fair share of rain. This means that homeowners need to find a roofing material that is not only resistant to water but isn’t susceptible to damage caused by the weather we mentioned above. The good part is that metal roofs are resistant to water, which will help protect your home during wet weather. When you think of metal roofs, it’s possible that you may think they could be noisy when it’s raining outside. In actuality, this common belief stems from metal roofs that were installed over open frames such as barns or patios, which helped amplify the sound of rainfall. However, when metal roofs are installed over homes, they’re installed over a solid wood deck. 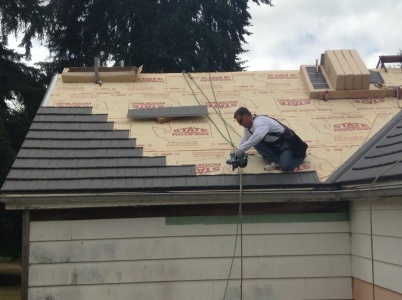 Having this extra layer helps insulate the noise caused by rain hitting metal roofs. This also means that metal roofs can actually be quieter during the rain as compared to other materials such as asphalt shingles. Metal roofs are ideal for the wet weather that comes with living in the Pacific Northwest. You’ll get a roof that’s resistant to rain and that insulates the noise that comes with rainfall. Another great advantage of metal roofs is that they’re virtually maintenance-free. Metal roofs aren’t affected by the damage that algae and moss can cause on asphalt shingles or wood shakes. Considering that we’re in the Pacific Northwest, there’s really no way of escaping the abundance of rain and moisture, meaning that there’s also no way to avoid these organisms from growing on your roof. The good part is that metal roofs aren’t porous so they don’t retain moisture like asphalt shingles. Because metal roofs don’t retain moisture, they’re not ideal environments for algae and moss to grow on. As we mentioned earlier, the three different metal roofs we offer here at State Roofing are all finished with Kynar 500 and SMP finishes. This creates a surface that won’t crack, split, or break, all of which are common issues that are seen in asphalt shingles. Metal roofs are a hassle-free option that will help improve your home’s value. They’re impervious to damage caused by algae and moss because they don’t retain moisture. Plus, they feature a surface that doesn’t suffer from the common ailments that are seen in asphalt shingles or wood shakes. Did you know that homeowners are becoming more conscious of the materials used in their home? They’re seeking out material and goods that promote energy efficiency, from washing machines to light bulbs to roofing material. To be more exact, 48% of buyers on the market listed energy efficiency as a desired home characteristic, according to Zillow’s 2017 Consumer Housing Trends Report. Metals roofs help promote energy efficiency in that they’re able to reflect solar radiation instead of absorbing the heat. As stated by the Metal Roofing Alliance, this amounts to savings up to 40% for air-conditioning costs such as running AC units or fans during the warmer months. Let’s not forget the ultimate way to drive energy efficiency in your home: solar panels. 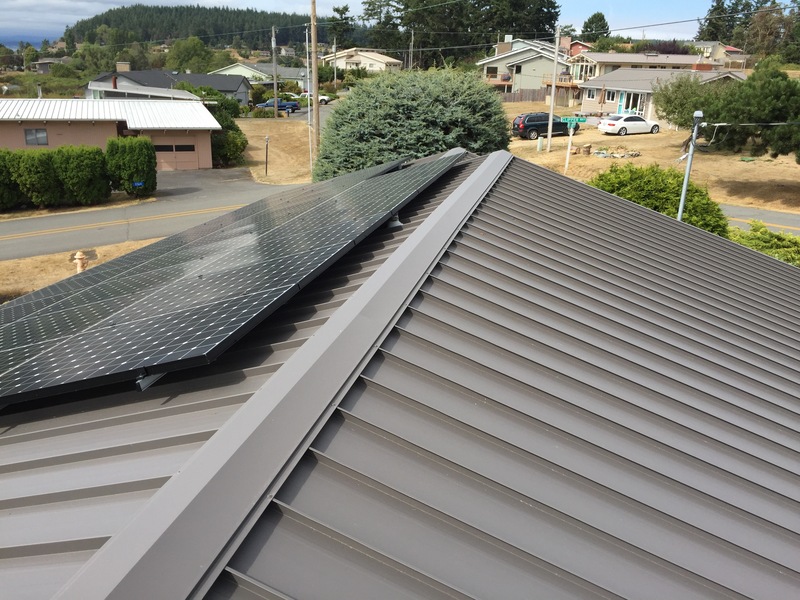 Metal roofs, such as the standing seam that we offer at State Roofing, allow solar panels to be easily snapped right into place. This eliminates the need to penetrate the roof, reducing the risk for potential leaks. Energy-efficiency is one of the most sought-after factors in today’s home. With that said, metal roofs are great at reducing air-conditioning costs during the warm months, and some come solar-ready. Metal roofs are an ideal option if you’re looking to improve your home value. They’re revered for their incredible durability, being able to withstand wet, windy, or wild weather. This factor also makes them perfect for the weather the Pacific Northwest has to offer. Algae and moss don’t have a negative impact on metal roofs because they don’t retain moisture, making them an inhospitable environment for these organisms to grow. Also, metal roofs are an energy-efficient option because they help reduce cooling costs and come ready for solar panels that can easily be snapped on. For more details on metal roofs, give us a call at (360) 205-3100 or fill out our contact form for further inquiries or to request a free estimate, whether you’re in Seattle, Olympia, Bellevue, or surrounding areas.